Do you have an issue that is very close to your heart. Do you hang things that are worth fighting for. The Best of Enemies is about a real story based in 1971. In North Carolina schools were still segregated due to neighborhoods not being diverse. The Supreme Court allowed for buses to bus students to other schools helping with desegregation. Sometimes you go to the movies for some light hearted popcorn fare. Sometimes you go to be educated. The Best of Enemies is the latter. I learned so much watching this drama. School segregation in the south does not make for easy movie viewing. When you throw in the President of the Durham, N.C. Ku Klux Klan C.P. Ellis (Sam Rockwell), it gets downright ugly. The Klan is a hate organization and it’s hard to watch their real life antics play out on screen. Luckily, Ann Atwater (Taraji P. Henson) leads her community with strength and compassion. She is helped by Bill Riddick (Babou Ceesay) who sweeps into town to perform a charrette (See? Educational movie. Have you ever heard of a charrette? Look it up.). How do a Civil Rights activist and a Klansman become friends? That is completely answered by Director/Writer Robin Bissel (based on the book The Best of Enemies: Race and Redemption in the New South by Osha Gray Davidson). Ms Atwater is a woman with a forgiving heart who must have believed in redemption. I admire her greatly after watching this film. Stay for the credits. The real life Ann Atwater and C.P. Ellis will entertain with their tales. 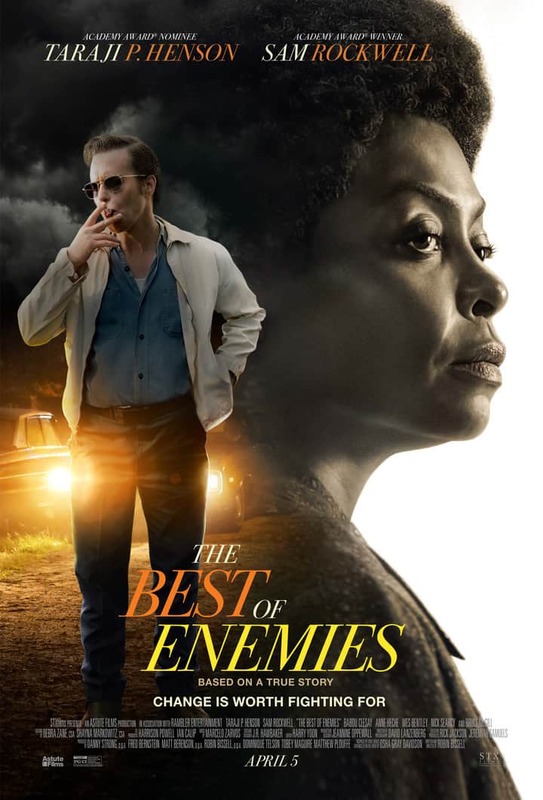 The Best of Enemies s a timely drama starring Academy Award® nominee Taraji P. Henson (Hidden Figures) and Academy Award® winner Sam Rockwell (Three Billboards Outside Ebbing, Missouri). Our KC readers were able to go to Cinemark Merriam on Wednesday, April 3rd at 7pm to watch the movie for free. Seats are always limited and are a first-come bases. Good afternoon please put me on the list.